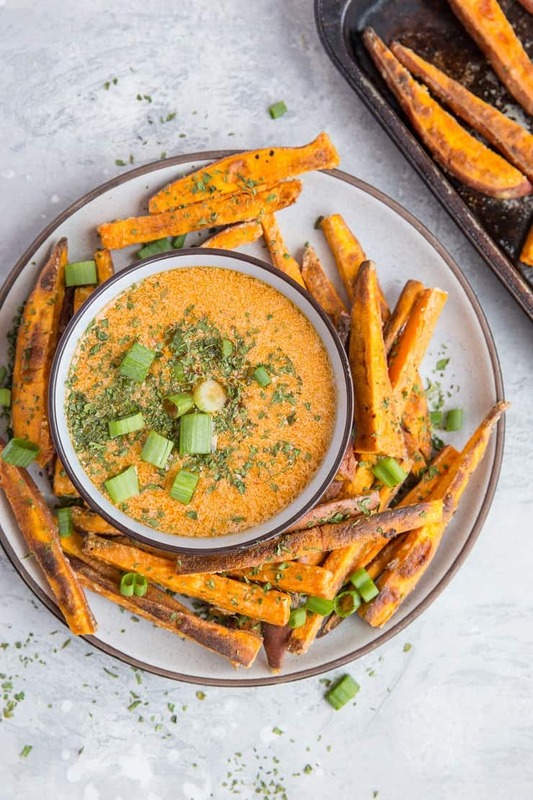 Perfectly crispy baked sweet potato fries made with an easy chipotle dipping sauce is a winning side dish to go alongside your burgers, roast chicken, salmon, etc. 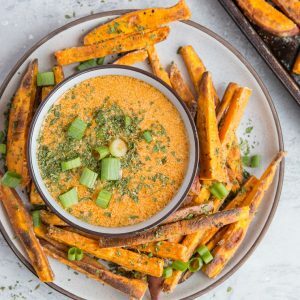 This recipe is inspired by a recent trip to one of my favorite restaurants in Reno, Sasquatch, which happens to have THE BEST sweet potato fries in ALLTHELAND! No joke…if you’re ever in Reno, I highly recommend you make the trip to Sasquatch…if not for the life-sized statue of Sasquatch himself, for the sweet potato fries. And the burgers. Moving right along.. The sweet potato fries come with a chipotle dipping sauce which is just out.of.this.world. I can’t tell if I do the fries for the fries or for the dipping sauce…it’s all just a whirlwind of colors and flavors, to the extent that I can’t tell where I begin and the fry ends. Seriously, it’s magical. 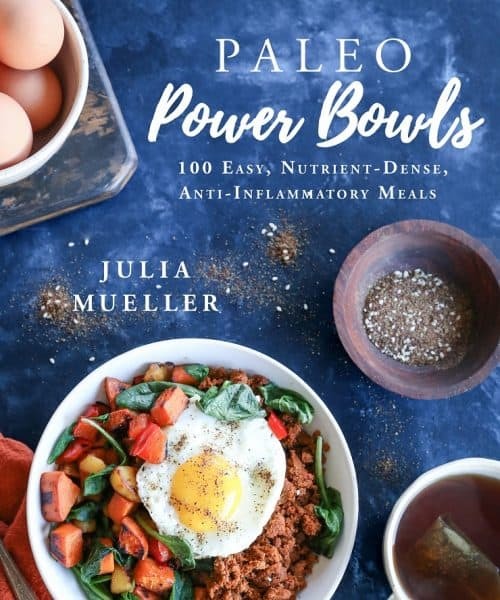 So that’s where this recipe comes in. I wanted to re-create the chipotle dipping sauce and it happened to be incredibly easy to do so. It only requires a few ingredients and basically zero effort. You just stick everything in a blender, blend until cream, and you’re done! Mayo. Let’s talk about it. I’m super particular. I either do a homemade aioli as opposed to mayo, or I buy avocado oil mayonnaise. For me, the type of mayonnaise makes a difference, but if you don’t have preferences, feel free to use any type of mayo you enjoy. If you want to lighten it up, you can use ½ cup mayo and ½ cup Greek yogurt instead of 1 cup mayo. 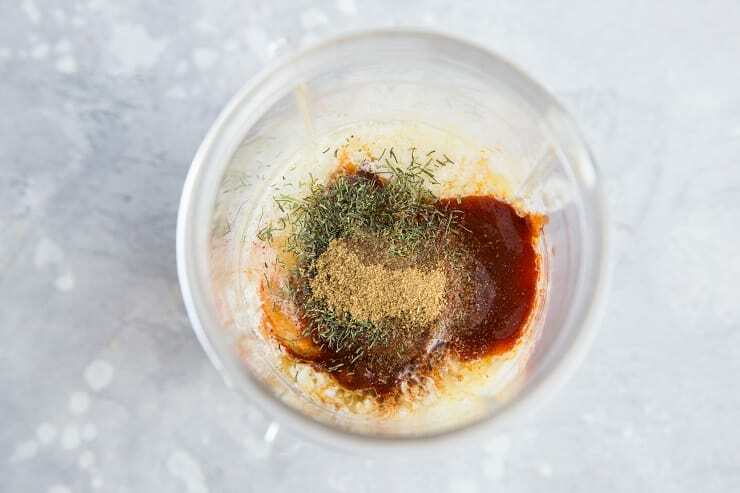 You can use this dipping sauce in a myriad of ways – use it as sauce for your burgers, sandwiches, and wraps, or even as a creamy salad dressing. Now for the fry portion. 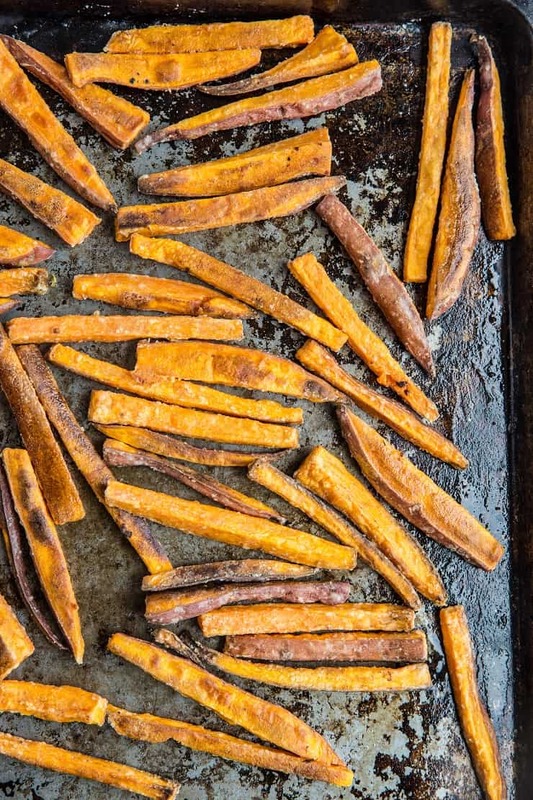 I posted my biggest trick for crispy sweet potato fries years ago in this post -> Cinnamon and Coconut Sweet Potato Fries. The trick is nothing more than to toss the raw cut sweet potatoes in tapioca flour (in addition to olive oil and sea salt of course). The tapioca flour helps create a nice crisp and absorbs some of the moisture so that the fries are crunchy on the outside and soft on the inside. For homemade baked sweet potato fries made without a deep fryer, they’re pretty awesome! They’re no Sasquatch fries, but they’ll do. 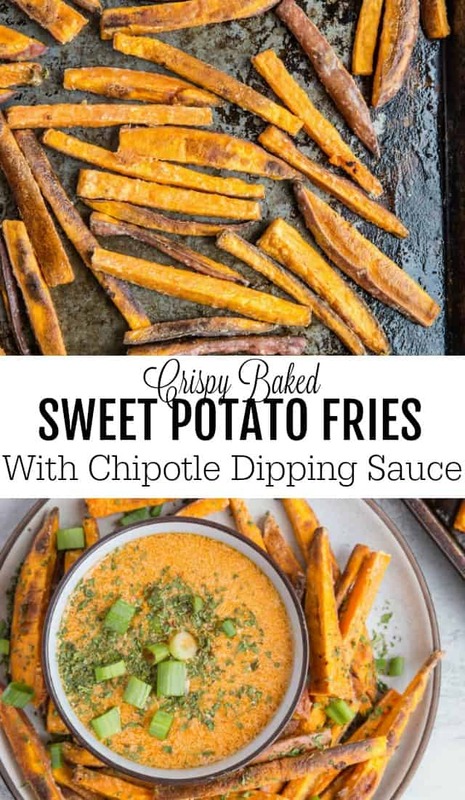 But the crispy sweet potato fry and the chipotle dipping sauce combo…pretty winning for a weeknight side dish (slash dinner if you dabble in the fries-for-dinner situation). We make them every time we make burgers, but also sometimes when we grill. Hope these become a staple in your house too! Place cut sweet potatoes into a large mixing bowl, followed by the rest of the ingredients for the fries. Use your hands to toss everything together until well coated. Spread fries over 1 or 2 large baking sheets, giving the potato wedges plenty of room so that they bake evenly. Place on the center rack of the oven and bake for 25 to 30 minutes, flipping the fries half-way through, or until fries are golden brown and crispy. 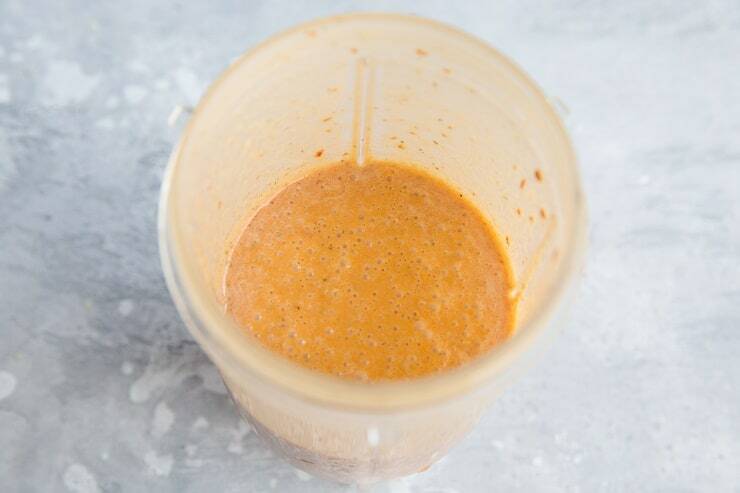 Add all ingredients for the chipotle dipping sauce to a small blender and blend until completely smooth. Use immediately or refrigerate in an air-tight container until ready to use. Sauce will keep in the refrigerator for 7 days. *I use avocado oil mayo. You can also go with 1/2 cup mayo and 1/2 cup Greek yogurt to lighten this up. **acquire one can of chipotle peppers in adobo sauce in order to fulfill this ingredient. Simply open the can, spoon our one whole chili and measure one tablespoon of the sauce. You can use the rest of the can of chilis for Barbacoa Beef. I’ve never heard of Sasquatch but will have to check it out next time I’m in the Reno area! Normally we hit Burger Me! 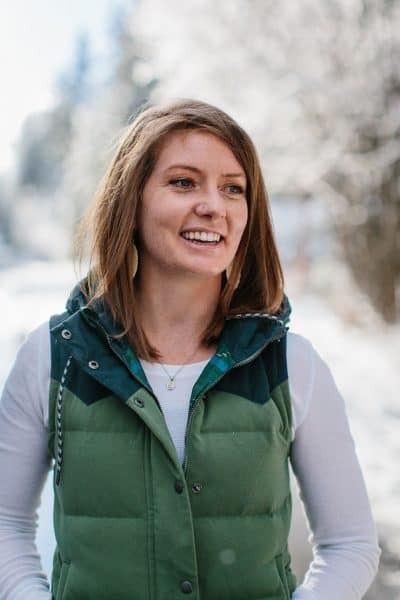 in Truckee and sometimes Reno because their sweet potato fries are off the hook….I wonder which ones are better?? I love the tip to toss them in tapioca flour — I need to try that! My boss eats at Sasquatch. I have wanted to try it, bit almost never in the area. We will have to make a special night of it and share a plate of sweet potato fries with you! Let’s do it! You’d love it! Sweet potato fries are the BEST, and with this sauce? Dang, I’m in! These look great. Making them very soon.